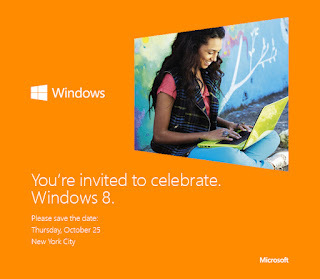 While it has already been confirmed that Windows 8 will officially launch Oct 26th Microsoft has announced plans for a Windows 8 launch event to take place Oct. 25 in New York City. The invite simply states, “You’re invited to celebrate. Windows 8” with few other details. Could this mean the company has other things in store for the announcement? It's entirely possible! What that might be could be anyone's guess. But speculation is that Microsoft will be showcasing the much anticipated Microsoft Surface tablet and perhaps even revealing the actual pricing of the new devices.